Summer is the ideal tennis play time for children and young people to practice their favorite sports. School holidays and good weather are the perfect incentives for kids to spend their free days practicing a sport outdoors. That’s why the best way to spend the holidays is to enjoy a tennis camp where you meet new people and develop your sports skills. Many are fans who enjoy watching and playing tennis games, and there are more and more young people who practice and admire this sport. That is why there are currently many tennis camps aimed at children and young people who want to improve their technique during the summer and learn more about this sport. For beginners who have never caught a tennis racket, for experienced players who want to improve their game and move to a higher level, and for good players already playing tournaments and They want to ascend to excellence. Although there is a different camp for each type of player, they all have common benefits, making children from an early age interested in the sport and doing physical activities that favor their quality of life. There are many benefits that the kids who participate in these sports camps, covering both physical, psychological, social and behavioral aspects. Our tennis camp Playing tennis on a regular basis produces obvious improvements in the physical condition of boys and girls: they develop concentration, speed, balance and coordination. In addition, this sport increases physical endurance, develops muscles throughout the body and ability to react. And, being an aerobic exercise, it minimizes the risk of suffering cardiac diseases and problems of obesity. Tennis in addition to being healthy is a very fun sport, which is a challenge for the mind and body. The practice of this sport makes the young people develop their discipline, their responsibility and learn to assume their own mistakes. It is a very technical sport that increases confidence and self-control and teaches younger people how to handle pressure in difficult times, learning to win and lose. 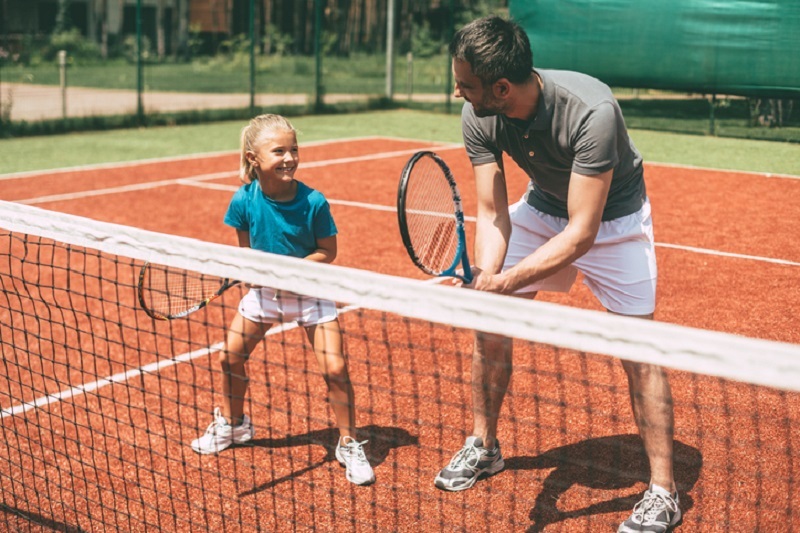 But the boys and girls who participate in a tennis camp not only develop their physical and mental capacity but also learn to socialize outside their usual environment. Meeting new people with their same interests will improve their social skills and learn to interact in a healthy and healthy environment. In addition, it is very common for these camps to have an international character, so the kids will live in an open and multicultural environment with boys and girls from all over the world, which will open their minds and be more tolerant. They will discover new forms of fun and learn to make friends away from new technologies, TV, and video games. There are also tennis camps in which not only sports but also pay attention to languages. Some of these camps are taught in English or directly in other countries. In this way, the player will not only improve his ability in sports but increase the level of English thanks to a total immersion in the language, which will open many doors both professionally and sport. Therefore, in these summer camps, you can transmit in a positive way the benefits of sports practice, and the healthy values and habits that are derived from tennis. The cheerful, active and supportive atmosphere will make the kids improve and perfect their skills, living new experiences and developing their sports spirit. Boys and girls who are encouraged to participate in a tennis camp will enjoy a summer full of activities, sports, and new friendships. Without a doubt these campuses are the ideal leisure alternative to spending the summer free days, combining fun and sport, and making summer holidays something more. We leave you our section of play tennis camps. In case you have encouraged to point your child to one of them.